Thank you for your reply (on paper) to my letter to you of April 30, 2014 in which I asked your government to support a bill similar to Private Member’s Bill C-363 (2011), an Act respecting Conscientious Objection to the use of taxes for military purposes, which would allow me to direct that all my taxes be spent only for peaceful purposes. The Prayer of St. Francis, “Make me a channel of your peace”, I have sung often, but I never knew that St. Francis of Assisi took his peacemaking efforts right up to a political and international level until I read this book. Paul Moses, a New York journalist, editor and professor, did a thorough piece of research to find out as much as possible about an intriguing event of the 13th century. During the Fifth Crusade in 1219 the Crusaders aimed at capturing the city of Damietta in the Nile Delta as a start to the capture of Egypt. 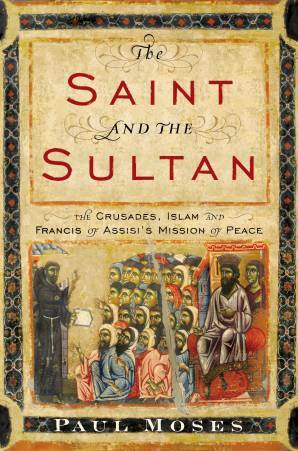 Francis felt called to try to avert the impending violence by meeting personally with the Sultan of Egypt, Malik al-Kamid, a nephew of Saladdin. Accompanied only by another brother, he travelled on foot and unarmed from the Crusader encampment on one side of the Nile right to the Sultan’s camp across the river and 8 miles south. The men’s peaceful demeanour disarmed the guards and they were taken to the Sultan, whom he greeted with “May the Lord give you peace.” He denied being an emissary of the Crusade leaders, and claimed he had come as a messenger of the Lord God, and asked for a hearing. by Esther Epp-Tiessen, Public Engagement Coordinator for MCC Canada’s Ottawa Office. 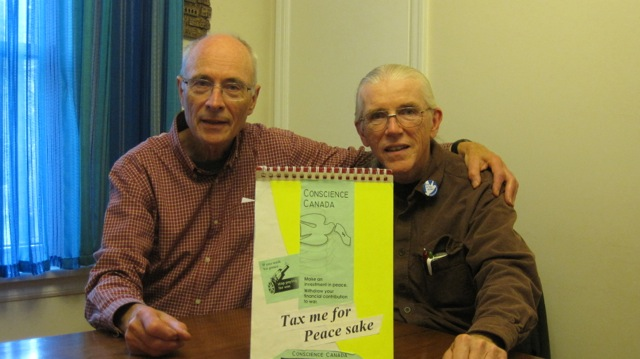 On October 18, 2013, board member Don Woodside presented on Conscience Canada at a workshop at the Canadian Peace and Justice Studies Association at Wilfred Laurier University in Waterloo ON. The workshop was organized by Jack Payden-Travers, director of the National Campaign for a Peace Tax Fund in Washington DC, and the third presenter was Maria Santelli, director of the Centre for Conscience and War, also in Washington. The panel was advertised as: “Conscientious Objection to War, Tax Resistance and Peace Tax Funds”. Maria did a very interesting PowerPoint presentation about conscience in general, and conscience as it relates to soldiers; how they have to be specially trained to shoot to kill, for example, and how they are routinely traumatized by the experience of war and killing. My reaction to her talk was that we speak too little about conscience, what it is, how it guides us (or not), and the impact of ignoring it. Jack talked about the national campaign in the US, its goals and recent history. He talked about the development of resistance to war as a human right. He also talked about a variety of funds into which resisted taxes can be deposited, some of which are spent, like the People’s Life Funds. 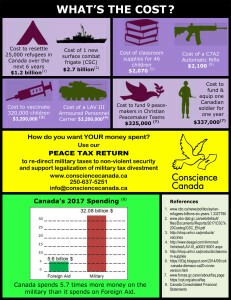 I reviewed Conscience Canada’s history and goals, and the recent shift to promotion of nonviolent conflict resolution. I was born and raised in a Swiss community in the United States that was settled in the early 1800s by mainly European Ana-baptists and my parents were members of the local Mennonite Church. Living in the United States at that time meant that as an 18 year old boy I had to register with the American military so that I could be conscripted into service whenever needed. As I look back now, that is a young age to make such a life-changing decision. But, that is the way it was in the 1960s. I talked about it with my parents, of course, and they helped me understand my options. This past week has provided Canadians with a series of warm and fuzzies that, like most of this nation’s mythology, were built on self-congratulatory lies. From the breathless and ankle-deep CBC and CTV interviews with former prime minister Jean Chretien to the Globe and Mail’s front-page shout out to that most disingenuous of foreign ministers, Bill Graham, the occasion was the 10th anniversary of the 2003 escalation of the 23-year war against the people of Iraq. 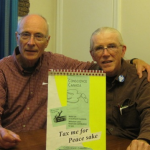 Conscience Canada hopes some members and supporters will take the time to share their stories of conscience and nonviolence. We hope to be able to use some of them in our next newsletter, coming out in September. For more details, contact <janslakov at shaw.ca> or see our most recent newsletter, posted on this site. One great source for such stories is a new book, Crossing the Line: Nonviolent Resisters Speak Out for Peace . Going to prison for nonviolent civil disobedience against American war-making does wonders to clarify one’s relationship with the U.S. government. I highly recommend it. When I reflect back on my life, it seems I have been preparing for civil disobedience, facing jail or trial, or undergoing probation regularly for 30 years. I’m mainly engaged in writing, speaking and teaching peace to build up the anti-war/global peace movement, but periodic civil disobedience and nonviolent protest have become for me a way of life. Along the way, one meets the best people. Volume two of Rosalie Riegle’s massive oral history project, Crossing the Line: Nonviolent Resisters Speak Out for Peace (Cascade Books, 2013), makes me realize I’m not alone. This massive collection of interviews with U.S. anti-war resisters (along with Doing Time for Peace, which I reviewed last month) provides an unprecedented historical record of nonviolent resistance over the last five decades and shows how many of us have quietly given our lives to resisting American war-making and practicing nonviolence. 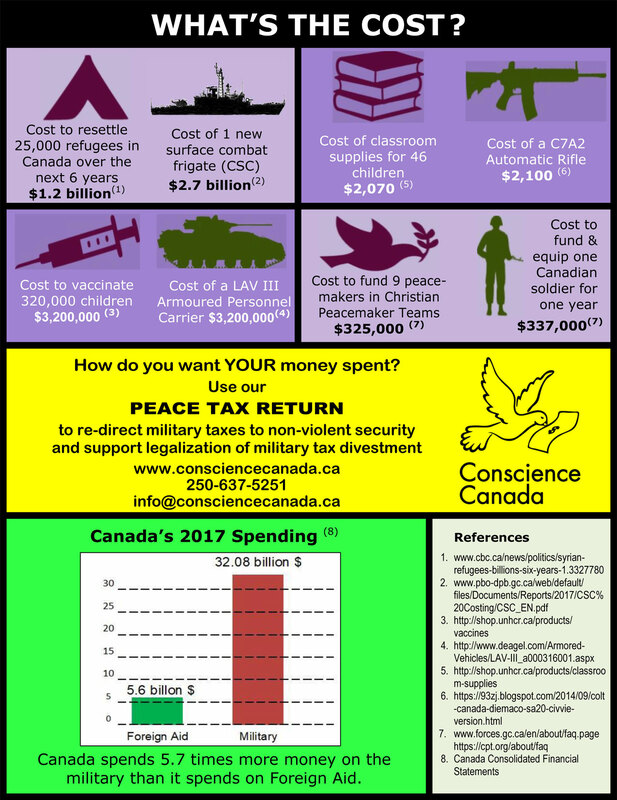 If you send an online Peace Tax Return through this website, you will have the option of sending a letter to cabinet Ministers and others who are responsible for tax policy, including recognition of conscientious objection to military taxation. Your letter will automatically be sent to the Ministers of Finance and Revenue, and to the Prime Minister and Opposition leaders, as well as Alex Atamanenko, the MP who is supporting conscientious objection to military taxation through his private members bill. You can always find out who the ministers and critics are through the Parliamentary website. We encourage you to send letters by mail if possible, as these generally carry more weight than letters sent by email. Ian McKay and Jamie Swift. Warrior Nation: Rebranding Canada in an Age of Anxiety. Toronto, Ontario: Between The Lines, 2012. 362 pp. i-xiii. ISBN: 978-1-926662-77-0. Includes bibliographical references and index. $24.95. Also issued in electronic format. On June 14, 2012, I attended the second of 3 book launch presentations in Ottawa. 50 people came to hear two scholars discuss Canada’s future, sponsored by Canadian Centre for Policy Alternatives, Council of Canadians, Workers History Museum, Citizens for Public Justice, and Octopus Books. Their topic was Canada’s democracy and how the current Conservative Government has been attempting to rebrand the country from a peaceful one to a militaristic one. over. And who will take the responsibility for such short-sightedness?